onscreen by accessing the camera of the device. In other words, it helps businesses and developers in overlaying digital data by incorporating real world objects. Augmented Reality has been a huge craze among the developers of today as an innovative technology. It has deeply influenced the landscape of mobile app technology and as a result has been adopted by multiple industries in showcasing their products and services for the targeted audience. two distinct forms of AR apps: marker-based and location based. The use of location based AR apps helps in utilizing the exclusive capabilities of the mobile devices for monitoring the position of each device. It further helps in providing contextual data depending on the definite location of an individual device. On the other hand, using marker based AR apps an user can see a virtual UI on top of an object which has been pointed by his/her smartphone. 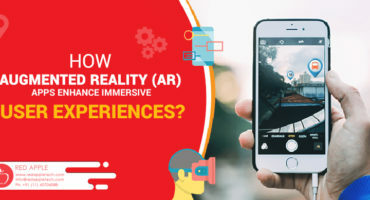 Hire AR app developers to create immersive games along with enabling customers to avail their desired products and services smoothly and conveniently. AR apps can perform the responsibility of a virtual instructor for regular maintenance-checking tyre pressure, changing oil etc. Helps in enhancing product sales using attractive brand contents-TV footage, music videos etc. information. An user can scan the AR code using his/her smartphone to experience digital contents & information in the firm of videos, audios, animation etc. Furniture App: Multiple AR based shopping apps are available on the internet which can be used easily for purchasing home furniture. Such apps can help users to add virtual furniture digitally in the actual space of the room. So using the apps you can place photo-realistic virtual furniture in your room to have an idea regarding the actual look & feel. Virtual Dressing App: AR technology has created apps which can help in integrating retail cloth stores through AR mirrors. For example, Trialkart is an online dressing room app which can be used to try products listed online and visualize how it would suit you. You can also purchase your favorite accessories using this app. discounts, offers or even launching of new products/services. Maximum Users: AR being an advanced concept has been deeply influenced by the growth in technology. From business to entertainment AR has mastered all. 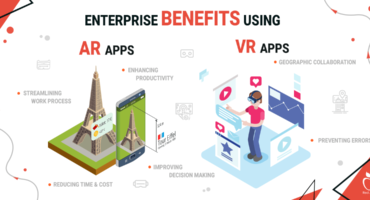 The immersive nature & scope of AR apps has made them widely acceptable in creating engaging apps for enterprises & gaming. The reach of AR technology can benefit different types of business-manufacturing, retail, IT, telecom, fashion etc to serve varied demands with ease and convenience. Similarly AR apps can be used for creating multiple games which are both immersive and distinctive for attracting and retaining players. Social Media Platforms: The social media platforms have gained prominence in recent times. Such platforms are mainly used to strengthen and increase social networks online. Hire our AR app developers to create engaging and an everlasting impression for attracting and retaining customers across the globe. 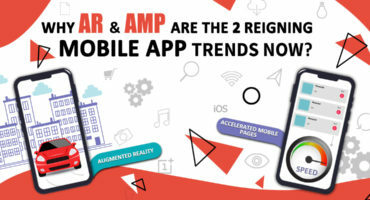 Why AR & AMP Are The Two Reigning Mobile App Trends Now?